*Update: Well, this was nice while it lasted, but Microsoft Live has taken Magazines.com down. The $13.95 cash back must have been a price mistake! I was a little hesitant to post this deal because it's a little bit involved, but for those of you who are intent on getting your All You Magazine every month, and don't mind a little work, here's how to get it for 50 cents an issue! 1. Register here for a Microsoft Live account. 2. Go to Magazines.com from your Microsoft Live account. 3. 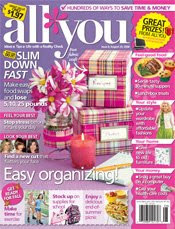 Order a year's subscription to All You for $19.95. 4. When you check out, select the "gift subscription" option; that way your subscription won't auto-renew next year and charge you $19.95 again. I have a question about this one. What do you mean the 13.95 is showing back up in your windows live account? What do you then do with that money? It will say "pending" for 60 days because they want to make sure you don't make any cancellations, but after 60 days, you can request payment of the $13.95 by Paypal. I just ordered the magazine and then checked my email. RedPlum sent me an email that has a $5 off coupon code "schoolmags" for www.magazines.com. I'm not sure if it will work or not for the ALL YOU magazine because I already ordered mine. It might make the deal even sweeter! Just thought you might want to know. Sorry for the previous post. I just called to see if they would apply it to my account anyway, but I guess the coupon is only for certain ones and All You isn't one of them.